Mandarin Chinese has two very unusual vowels. We touched on them when considering the question of shih tzus (26-27 Jan). Cheung Kwan-hin has been advising me how best to write them in IPA, for a possible future revised edition of LPD. (The symbols [ʅ,ɿ], used by sinologists, are not recognized by the IPA.) After discussion, we have finally decided to transcribe them as you see here. If I’ve got it right, the vowel of shi, zhi, chi is basically a retroflex approximant. There is also raising of the central part of the tongue, giving an [ɨ] colour. So we write it with the symbol for a retroflex approximant, [ɻ], with a following superscript [ɨ] to show the close central unrounded coloration. The vowel of si, zi, ci basically has an alveolar approximant articulation, so [z] with, subscript, the lowering diacritic [˕], and a following superscript [ɯ] to show the accompanying close back unrounded coloration. In transcription one often has to choose between detailed phonetic specification and transcriptional convenience. For the latter the Pinyin with its implied phoneme /i/ is adequate. But for my purposes I felt it would be better to err on the side of phonetic explicitness. Now there was this empress called 慈禧 Cíxī... I wonder if she had a shīzi dog. I’m ashamed to say that I got caught out by a restriction on WWW filenames that I had not realized existed. What happened was this. I received from an undergraduate in Iceland an electronic copy of her BA dissertation, the topic of which was Estuary English. She wondered whether I would like to put it on the Estuary English webpage that I look after. I thought it was quite a good essay, particularly because it includes a phonetically transcribed interview with the footballer David Beckham. So I uploaded it onto the server for the Estuary site and placed a link to it on the EE homepage. The student’s name is Guðlaug Hilmarsdóttir. The filename she had given her dissertation was very long, and I had decided — as is my custom — to replace it with something shorter. Usually I just take the author’s name, so I named the file guðlaug.pdf. I checked that the link to it worked properly, and thought no more about it. But then I got a complaint from the student’s supervisor at the University of Iceland, Pétur Knútson, that people were getting ‘404 Error file not found’ when they clicked on the link. I checked. Everything still worked perfectly well on my browser (Firefox). But then, just to be sure, I tried it on Internet Explorer. Ha! File not found. I tried it on the Opera browser. Same thing. And I realized that I had broken the rules by using the Icelandic letter eth (ð) in the filename. The only letters allowed in URLs are those of the basic ASCII set: no diacritics, no special letters. Speakers of virtually every language other than English are discriminated against. Firefox is admirably error-tolerant, as I have mentioned before. In this case it tolerates a non-ASCII letter in the URL. The other browsers don’t. Update: Thanks to Kilian Hekhuis for explaining to me that it’s not quite as simple as that. He concludes, “This has nothing to do with FF being error-tolerant and tolerating non-ASCII letters, or IE/Opera being not, but the way the browser converts a non-ASCII letter (UTF-8 or not) and whether the server understands UTF-8.” You can read more. Now I know why the Saarbrücken city website is called www.saarbruecken.de, not www.saarbrücken.de. I have given Guðlaug’s dissertation a new, all-ASCII, filename. First, some spellings that don’t tell you anything particular. And now some that do. wid	 with	 rather puzzling. This spelling reflects a pronunciation that has both a voiced consonant at the end of with (which rules out the Scots and the Americans) and TH Stopping (typical of the Irish and the West Indians). Cockney/Estuary would tend to have TH Fronting in this word, for which the corresponding spelling would be wiv. So this looks like a young Englishman affecting a Caribbean pronunciation (see blog, 20 Feb). Even if he’s black, it could still count as an affectation, i.e. he’s putting on an act. wana	 want to	 not RP of my generation! I can reduce want to to /ˈwɒntə/ but not to /ˈwɒnə/. However I think someone of a similar background to me but fifty years younger could lose the /t/. So can millions of others. I think he’s a student, probably English, from London. I could be quite wrong. We’ll never know. Although the writer did not say where he was from, the fact that his native language uses ‘IPA characters’ suggests that in all probability he is from West Africa, since that is where we most typically find the use in orthography of such letters as ɛ, ɔ, ŋ. And so it proved to be: my correspondent was from Cameroon. Alongside you see a bidirectional mixed text from my inbox, with the same Arabic word written in three ways. First is a Latin-letter version, which includes a diacritic. Then comes the Arabic-script equivalent. 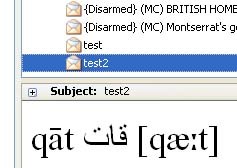 Although the letters were input in the order qāf-’alif-tā’, the software automatically makes them read right-to-left (the circle with the two dots above is the Arabic q, qāf, ق). The software also knows that the ’alif has to be rendered as a ligature with the qāf, not written separately. Lastly comes IPA. The software automatically switches the direction of the letters back to left-to-right. Everything works perfectly. Thunderbird is a delight. A similar problem arises in deciding the first element of /aʊ/, of /aɪ/, and of other diphthongs. Furthermore, in English the distinction between diphthong and long vowel is not always clear, as for example in the vowel of square, which some write /eə/ or /ɛə/, others as /ɛː/. The notation with a raised w is not a possible IPA notation, since [ʷ] (or [w]) denotes labialization, and you can’t labialize a labial or round an already rounded vowel. And of course the [w] element here is meant by those who use it to indicate something sequential, not a simultaneous secondary articulation (as in IPA). The Chagos islanders are in the news because of the threat by the president of Mauritius to leave the Commonwealth in protest at the UK’s ‘barbarous’ treatment of the islanders. They were forced from their homes at gunpoint in the 1960s, as an entire British colony was handed to the US so that a monitoring station could be built in the Indian Ocean. The exiles now live in the slums of Mauritius where they belong neither socially nor economically. They’re campaigning to return to the Chagos islands. On the Today programme on BBC Radio 4 yesterday two people discussed the issue. One of them pronounced the name of the archipelago /ˈʃɑːɡɒs/, the other /ˈʃæɡɒs/. This suggests that neither of them had consulted the BBC Pronunciation Unit. Possibly, as experts on the subject, they felt they didn’t need to. Because what the OBGP recommends (‘reflecting the experience of the BBC Pronunciation Unit’) is /ˈtʃɑːɡəʊs/. In view of the fact that the islands were discovered by Vasco da Gama and presumably named in Portuguese, we should expect the spelling ch to correspond to /ʃ/ rather than /tʃ/ (which is what it would imply in Spanish). The adjacent islands, Mauritius and the Seychelles, are French-speaking, which would again favour ch = /ʃ/. Until 1965 the Chagos islands were administered as part of Mauritius. I have an awful feeling that the BBC Pronunciation Unit must have consulted the Americans, current masters of the islands, rather than the islanders themselves, Mauritians, or British colonial administrators. 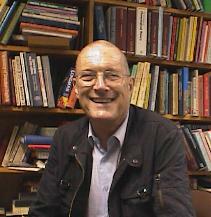 (Update: Catherine Sangster tells me they simply took it from the Duden Aussprachew�rterbuch.) Because I can quite see that Americans (who usually know some Spanish) would in all likelihood pronounce the name /ˈtʃɑːɡoʊs/. The on-line Merriam-Webster, however, gives /ˈtʃɑːɡəs/ with a weak vowel in the final syllable. But it still has that Spanish-style /tʃ/. We’ve all heard library pronounced as /ˈlaɪbri/, or probably as /ˈprɒbli/. Some of us know that these are examples of haplology, defined as the omission of a repeated sound or syllable. I remember at school, when I was in the classical sixth, the teacher wrote φιλόγος on the board instead of φιλόλογος. “Please sir,” I said, “you’ve committed a haplology.” (I was a real smart-arse as a teenager.) The teacher replied sarcastically, “I have made a simple mistake”. If I’d been even smarter, I’d have known that the term for a written as opposed to a spoken example is a haplography. Anyhow, I heard a new phonetic haplology the other day. It was from a medical consultant giving a talk on blood pressure. She repeatedly referred to the instrument used to measure blood pressure, the sphygmomanometer, as a /ˌsfɪɡməˈnɒmɪtə/. OK, this isn’t about the maltreatment of smallholding livestock. No, it’s about the possible weakening and subsequent compression of the vowel we use in the GOAT lexical set (see my Accents of English, p. 146-147). In RP and similar accents this is the vowel whose strong version we transcribe /əʊ/. It used to have a weak version that Daniel Jones transcribed [o] in the first twelve editions of EPD, as in November /noˈvembə/. When Gimson took over the editorship, he replaced this (quite rightly) with plain schwa, thus /nəˈvembə/, and nowadays we reckon that /əʊ/ indeed normally weakens to /ə/: microcosm, biosphere, proˈtest, Yellowstone, possibly also window-sill, tomorrow morning. But this doesn’t apply prevocalically. How can we weaken the unstressed first vowel of, say, oasis? The answer is, we can’t. However, there are one or two words in which the GOAT vowel appears to weaken prevocalically to /u/. A good example is tomorrow evening. Weakening to /u/ produces a candidate for compression, since this vowel can be compressed to /w/ before a weak vowel, so losing its syllabicity (blog, 16-17 January). One word in which this can happen is following, where /ˈfɒləʊɪŋ, ˈfɒluɪŋ/ can be compressed to /ˈfɒlwɪŋ/. This also applies in the archaic (thou) followest /ˈfɒlwɪst/, as proved by verse scansion. As usual, hymns show this well. This one was written as late as 1882. Driving to Gatwick Airport a few days ago to meet an arriving passenger, I passed through the village of Burgh Heath. As on previous occasions when I have travelled that route, I wondered idly how it’s pronounced. Is the first word /bɜː/ or /ˈbʌrə/? 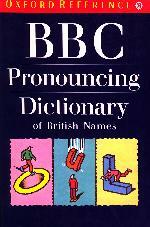 When I got back home I looked it up in the BBC Pronouncing Dictionary of British Names (G. Pointon, 1990), which says it can be either. Just not /bɜːɡ/. I further learnt that Burgh in Norfolk is /ˈbʌrə/, but Burgh in adjoining Suffolk is /bɜːɡ/. Things are different in the north of England: Burgh-by-Sands in Cumbria is metathesized to /brʌf/, which must mean that for many locals it’s more like [brʊf]. Tomorrow I have to go to Birmingham. To reach my destination the map says I have to look for the road leading to Alcester. Er... what was that? I checked with my brother, who lives not too far away, and he says it’s /ˈɔːlstə/. Then I looked in LPD and found that I agree. And there’s no call for Americans to feel superior to the wacky British. In the States you never know what will happen with Spanish names. I remember passing through Salida, Colorado. That’s the Spanish for ‘exit’, and it was at the mouth of a canyon, so I thought that in English it would be /səˈliːdə/. But the local radio station announcers, who should know, pronounced it /səˈlaɪdə/. Even English-derived names can be surprising. I remember driving through Placerville, California, and discovering to my surprise that it was not /ˈpleɪsɚvɪl/ but /ˈplæsɚvɪl/. Well, that’s not how a live native speaker of English would actually say those words. The announcement was obviously based on recordings of individual words or phrases spoken by a human being but concatenated on the fly by a computer. The announcer or actor being recorded must have gone through all the numbers that were needed, probably using a rising tone until he got to the end of the list. then everything would have come out fine. 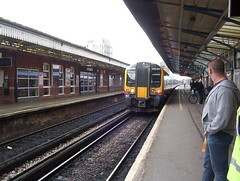 The 'train at platform \/three | is the /fourteen | forty-/two | to \Woking. The only satisfactory solution would be to have made two recordings of each item, and to have built in to the software the equivalent of the stress shift rule. But unfortunately speech engineers tend not to consult phoneticians. We learn something new every day. My cardiologist has recently started me on a new drug called amiodarone. He pronounces it /ˌæmiˈɒdərəʊn/, and that’s what my GP says, too. But today I went for a blood test to check that we have correctly estimated the change in the dose of Warfarin, which I am also taking, to allow for the interaction of the two drugs. The phlebotomist calls my new drug /ˌæmiˈəʊdərəʊn/. So should it be /ɒ/ or /əʊ/? A short o or a long one? Who cares? The spelling’s the same, which is what matters for the pharmacist who has to dispense it. As with so many learned, scientific or technical words, the spelling is fixed while the pronunciation fluctuates. (Having boned up on heart disease, I am almost inclined to say it fibrillates.) That’s because instead of hearing other speakers and imitating what they say, we often create a pronunciation for ourselves on the basis of the spelling, using the reading rules of English, which are notorious for their uncertainty. See yesterday’s comment on cervical.